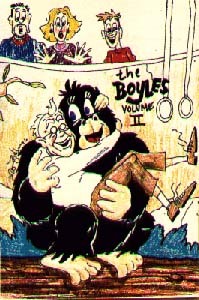 Buy this Audio Cassette with The Boyles - Volume 2 Cassette ~ Adam Kontras today! -Lester fulfills his lifelong dream of getting into the Guiness Book of Records. -Johnny gets suspended from school for sexual harrassment. -Johnny's gets a Nintendo 64 for his birthday and starts a family feud. -Lester falls asleep with the television on and havoc ensues in his mind. -After TV Dreamland's raunch, Adam tries to do a politically correct show. -Adam hires actors to play The Boyles after the family quits. -The Boyles get their revenge when Adam's at his most desperate moment. -Confused with the voting box, Lester votes for Clinton. He's devastated. -Johnny ends up getting the lead in the school play opposite Suzy. 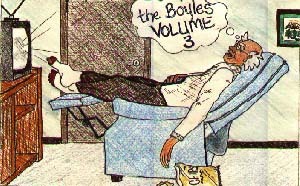 The Boyles - Volume 3 took a somewhat raunchy turn on October 19th, 1996 with "TV Dreamland". What followed in the next 3 episodes is the most celebrated subplot of The Boyles. A subplot Adam repeats in 2004 with The Trinitrons 3: The Band Strikes Back. Travel with the family as they revolt against Adam, vote for president and support Johnny in his school play with Suzy. If you can only buy only one cassette, this is your volume.